To commemorate the upcoming release of the 14th volume of Watari Wataru ‘s Yahari Ore no Seishun Love Comedy wa Machigatteiru. 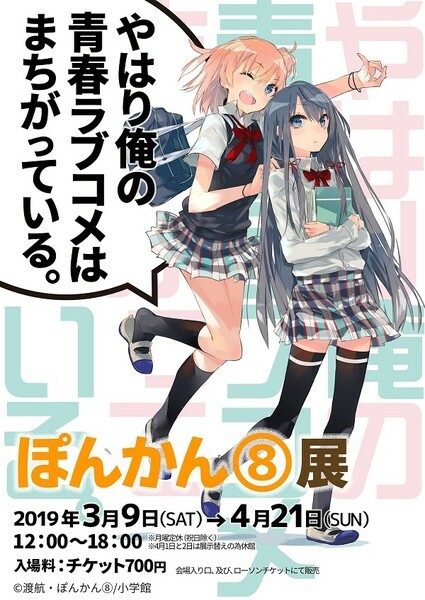 ( My Youth Romantic Comedy Is Wrong, As I Expected) light novel series (also known as Oregairu ), illustrator Ponkan8 will hold an exhibit from March 9 to April 21. The exhibit will be held at the Gallery GoFa in Aoyama, Tokyo. It will show off both color and monochrome illustrations from the series, and offer original goods for sale. The exhibit will be divided into two phases. On April 1 and 2, the exhibit will be closed, and after that point, different art will be showcased. It will cost 700 yen (US$6.30) to enter. The 14th volume of My Youth Romantic Comedy Is Wrong, As I Expected will end the series. The novel’s release was originally slated for November 2018, but GAGAGA Bunko’s website now lists it for March 19. The 13th volume shipped in November 2018. Watari began the original Yahari Ore no Seishun Love Comedy wa Machigatteiru ( My Youth Romantic Comedy Is Wrong, As I Expected ) light novels with illustrations by Ponkan8 in Japan in 2011. The novels inspired two anime seasons, which Crunchyroll streamed under the titles My Teen Romantic Comedy SNAFU and My Teen Romantic Comedy SNAFU TOO! . Although Ponkan8 is best known for their work on My Youth Romantic Comedy Is Wrong, As I Expected , they also drew the original character designs for the Shirobako anime series. This entry was posted in Infos, News and tagged My Youth Romantic Comedy Is Wrong As I Expected, Oregairu, Yahari Ore no Seishun Love Comedy wa Machigatteiru..